Who’s Holding Your Messages Together? I grew up in a church tradition that prided itself on evangelism. One of the ways this emphasis manifested itself was that every sermon (no matter the topic) would conclude with an appeal to “accept Jesus in your heart,” followed by an altar call and invitational hymn. While good-intentioned, I believe that pattern can foster the creation of sermons which tend to be long on advice and short on the gospel. Most of the messages I remember hearing (and this goes far beyond my local congregation growing up) were essentially practical tips for living with a biblical verse or two for support. Biblical stories devolved into morality tales and sermons were lauded for their practicality because they were just that – practical – talks peppered with life-application points. Points so practical even a unbeliever could do them. And that was their weakness. Messages tended to be about what we needed to do and little about what Jesus had done for us. Again, primarily good advice instead of good news. 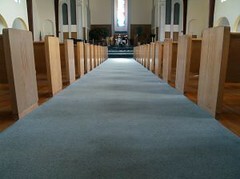 Yet, at the end of each message, the pastor would sincerely appeal to the congregation to accept Christ for salvation. No matter what the sermon was about, it always ended with an invitation to Jesus. I assume those who preached such sermons may have felt justified because they concluded with an evangelistic appeal. In other words, sermons were seen as biblical because the Bible was mentioned and Christ-centered because was Jesus was appealed to in the last five minutes (or ten to fifteen if no one had yet walked down the aisle). But these characteristics made them neither biblical nor Christ-centered. On the contrary, it often produced life-coaching talks with Jesus as a footnote. Christ-centered sermons have, by definition, Jesus at the center. In other words, gospel-centered messages point to the grace of God, most concretely found in Jesus, as our answer. It’s not that messages aren’t practical, they just don’t leave us to ourselves (with our own wits and strength to make it happen), but with Jesus, the Wiser and Stronger One for us. They are messages that look to and rely upon redemptive power instead of our own. For example, one of the questions I always ask before I preach is, “Why did Jesus have to die for this message?” If I don’t know, it may very well be because something other than Jesus is holding my sermon together. It’s not enough to preach self-help talks that have the need for receiving Christ as Savior tacked on to the end in a way that seems alien to the message. This will only confuse our congregants into thinking the gospel is for getting you to Heaven but not for living out your days on earth. Having Jesus merely in our “altar call” can mislead others to believe while only grace saves us, only sweat grows us. I mean why have Jesus anywhere else in your message if it’s all up to you? No wonder Christ becomes a footnote when the sermon really doesn’t need him to “work.” No! Our call is to move Jesus from the footnotes to the sum and mean of our preaching. To help our congregants continually see the glory and necessity of Jesus’ work at the Cross for us…right now…in our every day! If moving Jesus out of the footnotes would fundamentally change your sermons then know that you likely have been preaching something else than Christ. Remember, gospel-centered conclusions do not gospel-centered sermons make. So, who is holding your messages together?